Yes, you don’t need to deal with the inconvenience and discomfort of using two separate leashes in one or both of your hands any more. With a double dog leash, you can walk your dogs easily and without having to spend a lot of time untangling them. 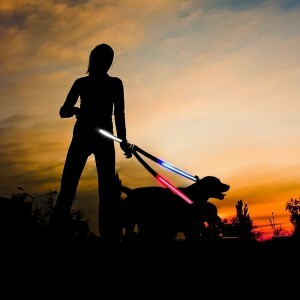 A perfect solution to walk two dogs at once while keeping both you and your dogs safe. 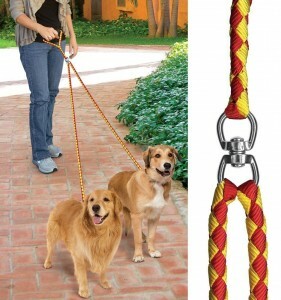 Make it easier to walk two dogs at one with the Pet Parade No-Tangle Dual Dog Leash. This dual dog leash has a soft foam ergonomic handle design to provide a comfortable and secure grip while dispersing load and eliminating pinching for a pain free experience. The tight, shock absorbing section allows you to maintain control while providing helpful feedback and resistance to your dog. Reflective strands woven through the entire length of this leash ensure added nighttime visibility and safety. Now you can have one hand free while maintaining control easily and comfortably with the Caldwell’s Original No-Tangle Dual Leash. A convenient way to walk two dogs, this dual leash features thick neoprene handle for maximum comfort despite using only one hand. The swiveling coupling piece allows your dogs to move with freedom without twisting up the two lead extensions. No more wasting time and money for cheap, ugly and flimsy products for your pets, this dual leash with high quality won’t let you down. 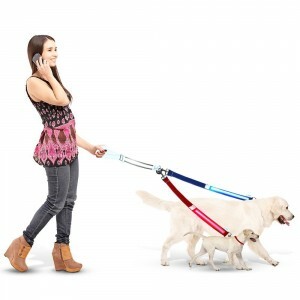 Forget walking your dogs separately, walk them together with this dual dog leash. The strong stainless steel coupler allows two leads to move independently so there are no injuries when walking your furry ones. Soft padded handle provides comfort. 8 Foot long leash gives your dogs greater roaming freedom while maintaining control. You can now keep one hand free instead of holding two leashes with this product. If you are looking for a tangle free solution to easily walk two dogs at the same time then you will be pleased with the Plixio Dual Leash. 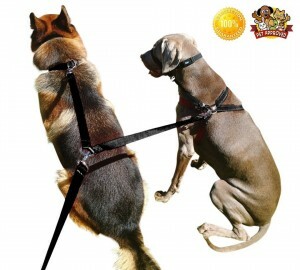 This dual leash will give you the freedom you desire while keeping your pets safely controlled. Leash is 54″ long to create enough room for even the biggest dogs. It features soft grip handle to give you comfort and full control over the dogs. 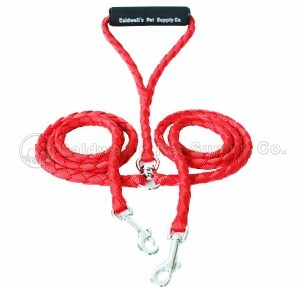 Made of braided Nylon and polyester, the leash is tough and strong enough to handle up to 500lbs of pull. Finally a great tool to walk your two dogs tangle free and safely. Made of high resistant Nylon webbing used in parachutes with unbreakable nickel steel links, this strong double dog leash is break proof even with very large dogs. The LED lights not only make look stylish and awesome, but also prevent accidents and allow you to walk your dogs safely. Designed to accommodate any dog breeds and dogs with different sizes.